Whether taking photos is a profession for you, a passion or something else, this collection of the best photography quotes are meant to do justice to the art form. To many, photography is about a profession. To others it’s about special occasion. There are others who think taking pictures is all about a phone with a camera. Then there are artists! Photography is one in fact one of the most important professions ever. It has touched more people than any other profession ever to be practiced – almost every human being since the invention of the camera has been photographed at least once their lifetimes. It has captured the lives and emotions of tens of billions of people throughout its history. Enjoy our collection of the best photography quotes. A landscape image cuts across all political and national boundaries, it transcends the constraints of language and culture. Look your subject in the eye. For a detailed explanation with photos, check out the full article at Kodak on taking great photos. One photo out of focus is a mistake, ten photo out of focus are an experimentation, one hundred photos out of focus are a style. When females take group photos. Gravity suddenly gets a lot stronger. The rarest thing in the world is a woman who is pleased with photograph of herself. A definition of a professional photographer: A pro never shows anybody the mistakes. How many photographers does it take to change a light bulb? 50. One to change the bulb, and forty-nine to say, I could have done that! 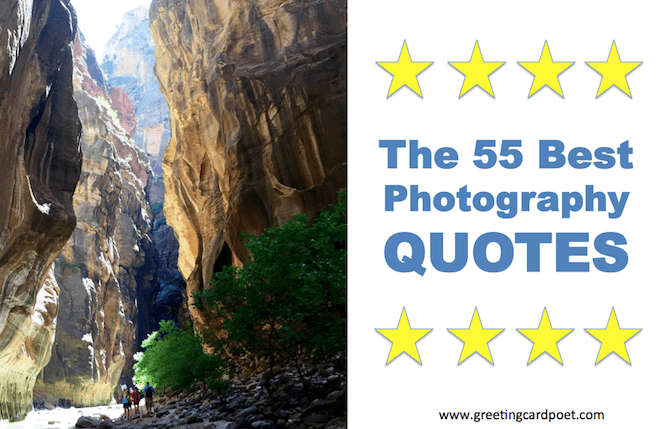 Tip: Some of these best photography quotes make great photo captions themselves. There’s something strange and powerful about black-and-white imagery. To see in color is a delight for the eye but to see in black and white is a delight for the soul. I work in color sometimes, but I guess the images I most connect to, historically speaking, are in black and white. I see more in black and white – I like the abstraction of it. Which is probably the reason why I work exclusively in black and white… to highlight that contrast. You’re on Best Photography Quotes.